You can learn all about Tally which you can use right now in practical life with these Tally ERP 9 Notes. I have written everything about Tally from basics to practicals and it is indeed the most detailed Tally ERP 9 notes anyone has ever written. I am not joking at all. Read the notes, complete the Tally practical assignment and you’ll know for yourself what I am talking about. You can read the notes here online and you can also download these Tally notes in the PDF format completely for free. Let’s start with the tally notes without wasting a single minute. I have divided these notes in smaller different parts so that you can understand the Tally notes easily with as much less doubts as possible. You can all each smaller part of the Tally ERP 9 notes as Tally short notes. The very first thing you need to learn about Tally is what is actually Tally. Do you what is Tally? For most of the people Tally means just an accounting software but Tally is much more than that. Do you know that in Tally, you can create budgets also? You can also maintain your employees details in Tally. There are many more features of Tally which you should know in detail if you want to fully understand Tally. I have written a detailed post on What is Tally and you should go through it. After going through the above post, you will have a very good idea of what Tally is capable of. 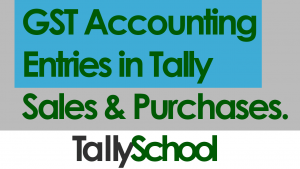 You will come to know that Tally is much more than just accounting. Till now, going through Tally ERP 9 Notes, you have learnt what Tally is capable of. Now let me show you everything in bit more detail. I have specially created a video about the introduction of Tally. In this video I have explained about different functions of Tally by going into each and every menu in Tally. Go through the below video and you’ll learn a lot about Tally. Now, let’s move ahead with our Tally ERP 9 Notes to the next topic which is about creating a company and ledgers in Tally. After you have downloaded and installed Tally for free, the very first thing that you need to do is create a company in Tally. A company in Tally means a client or a file. For example, if you want to maintain your company’s accounts in Tally, you have to create a company in Tally with the name of your company. You can easily know how to create a company in Tally in less than 5 minutes. Once you have created a company in Tally, you need to create some ledgers in Tally with which you can then create accounting entries in Tally. Ledgers in Tally are different accounts that are required for creating a complete accounting entry. Similarly for different types of entries, you need to create different ledgers in Tally. I have created an entire list of ledgers in Tally with examples. You can go through that list and you will know what will come under direct expenses and what will come under capital account and so on. After going through the above list, you definitely won’t have any doubts about whether salary account will be under Direct Expenses or Indirect Expenses. It is because I have classified each and every ledger in Tally with suitable and tonnes of examples for your understanding. Moving ahead with basic Tally notes, you will now learn to create basic accounting vouchers in Tally. From here, these Tally ERP 9 notes will become a bit more advanced and very much practical because now you will be learning many different things about GST in Tally as well. Don’t worry at all! No matter how advanced the Tally concepts become, I’ll make them very much easy for you with the help of examples and videos. 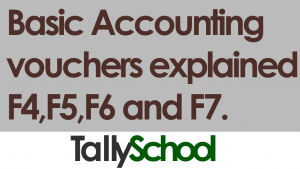 So, what is an accounting voucher in Tally? Accounting voucher simply as an accounting entry in Tally. A Sales entry is a Sales Voucher in Tally. Similarly, a Purchase entry is a Purchase Voucher in Tally. Voucher is just a technical name which is used in accountancy, otherwise all the vouchers are different accounting entries and nothing else. Go through this post of the basic accounting vouchers in Tally in which I have explained all 4 of the basic accounting vouchers in Tally with practical examples and a video as well. There are 2 more vouchers which are used by small to big businesses every day, millions of times. After the introduction of GST, it is necessary that you learn the Purchase and Sales Voucher in Tally with GST. But before that you need to know how to create simple purchase and sales voucher i.e. without GST. The reason for this is simple. I want you to understand Tally in the best way possible. And for that you need to learn simple concepts first and a little advanced after that. So, go through this post and a video about creating simple Purchase and Sales Voucher in Tally. After going through that, you should go through the following post on creating GST Accounting Entries with sales and purchases. GST Accounting Entries in Tally – Sales and Purchases. It is a bit more complex and advanced but I have tried to keep it as much simple and easy as possible. You can always comment and I’ll reply back with a solution to your problem. These were basic accounting vouchers with GST. Now in these basic Tally ERP 9 notes or we can call computer Tally notes, we are going to look at something very useful for you and interesting as well. In a single rate GST invoice, there is only 1 rate of GST on the entire invoice. So, for example, if a GST invoice is of ₹10,000 and the GST rate is 18%, then the GST on the invoice will simply be ₹1,800. But, in a multiple rate GST invoice, there can be more than 1 rate of GST on the entire invoice. For example, if the GST invoice is of ₹10,000 once again, but on the amount ₹5,000, there is 5% GST and on the remaining ₹5,000, there is 18% GST. Total amount of GST this time will be ₹1,150 (₹250 + ₹900). You see, in both the cases, the value of invoice was ₹10,000 but because of different rates of GST in each of the invoices, the amount of GST has totally changed. You can create both kinds of invoices in Tally and you are going to learn that right now in these Tally ERP 9 Notes. Go through this post in which I have discussed about creating a GST invoice in Tally with HSN/SAC code. This post only discusses about creating a GST invoice in Tally with single rate and with HSN/SAC code. After you have learnt that, go through the following video in which I have explained how you can create a single GST invoice with multiple tax rates. I have also written a post for this video if you like to read for future reference. Here is the link to that post – Multiple Tax Invoice under GST. Now, let us look at how you can create and manage e-way bills in Tally with the help of an example. From 1st April, 2018, E-Way bill has become compulsory in India and therefore you need to create GST E-Way bills if your invoice value is more than ₹50,000. In Tally, creating e-way bill is simple and you can create e-way bill for your invoice at the time of creating entries itself. You have to give certain details and that’s it. At the end of the entry, Tally will automatically export the e-way bill in JSON format which you can directly upload to the e-way bill portal and generate an e-way bill number. 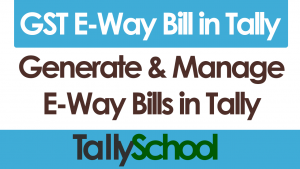 I have explained the entire method in this post on creating E-Way bill in Tally with a simple example. Let’s move ahead in our Tally ERP 9 notes and learn about some other important and advanced vouchers in Tally. What happens when you sell something but a customer returns the product or returns only a part of the product. That’s where you use credit notes and you can use easily create a credit note in Tally because there is a specific voucher in Tally just for that. In a similar way, let’s say you purchased a product and didn’t liked the product, so you return the product. In this case, you will create a debit note in Tally. 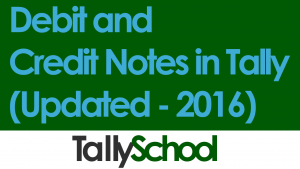 I have written a detailed post with a video on debit and credit notes in Tally for your better understanding. Read the whole post and also learn the examples as well. Now, let me tell you another situation. For example, you have put aside ₹10,000 for your monthly business or job expenses. But you are not sure whether it will be exactly ₹10,000 or ₹9,000 or more than ₹10,000. In this case, if you pass the accounting entry in Tally for ₹10,000, you will be creating a wrong entry and it will reflect wrongly in your accounts as well. So, here you can use memorandum voucher in Tally for passing these kinds of entries. The main feature of memorandum vouchers is that it does not affect your accounts unless you convert it to a general voucher. It is a kind of memo in Tally but in the form of an accounting entry. There are many situations like the one above in which we are not sure what will be the amount of the entry. In all those cases, we can use the memorandum voucher. 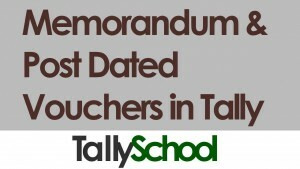 Go through this post on Memorandum Vouchers in Tally and you will learn it all. It is packed with different examples. In the above post, I have explained an another voucher called Post Dated Voucher in Tally. What if you get a cheque today but the date on the cheque is 10 days from now. It is a post dated cheque and giving post dated cheques is a very common practice. In this case, you can create a post dated voucher in Tally. Not just for post dated cheques, you can use it for any entry which is post dated in Tally. Above vouchers are somewhat advanced and therefore I call them advanced vouchers in Tally. Let’s go ahead in our Tally ERP 9 Notes because we still have good amount of syllabus to cover. A stock item is a product. For example, if you are selling mobiles, iPhone X is a stock item. Similarly, iPhone 8 is another stock item. You can also group all the iPhones together in a group called Apple because Apple sells iPhones. This is called a Stock Group in Tally. Let’s say, for example, you sold 5 iPhone X and 6 iPhone 8. Total stock items you sold are 13 iPhones. So what we did here? We measured the iPhones sold by numbers which is 13. It is called Units of Measure in Tally. Now, if you are selling milk instead of iPhones, you will measure the milk in liters. Here the unit of measure is liters. Similarly, depending upon the products you sell, units of measure can be numbers, liters, kgs, meters, inches and so on. You can maintain your entire stock or inventory in Tally. 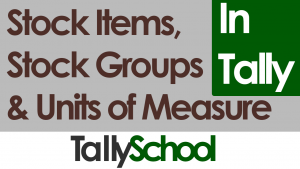 That is why I am asking you to learn how to create and use stock items, stock groups and units of measure in Tally. I have created two different posts regarding creating and using stock items in Tally. First one is on how you can create stock items, stock groups and units of measure in Tally and second one is on how to use stock items, stock groups and units of measure in Tally. Go through it and I am sure you will learn a lot about Tally which most of the people do not know. Mostly, people are confused about stock management in Tally and I have made it extremely easy for you to understand it. it extremely easy for you to understand it. You can also create stock market entries in Tally with the help of stock items in Tally so please understand the notes about stock management in detail. Now, what if yours or your client’s business is about manufacturing? This is what the next part is in our Tally ERP 9 notes. 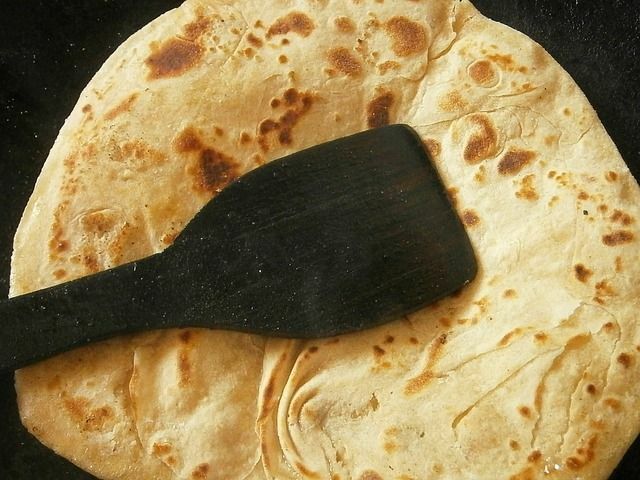 Let’s say, for example, we manufacture a roti (Indian bread). We need raw materials like flour, water, spices and so on. Our finished product will be roti. What if you can create an entire entry like this in Tally? You can and that too with very much ease. This kind of entry is called manufacturing entry in Tally. It can also be used for assembly of goods. For example, let’s say, you are getting roti which is made by someone else and packaging material from someone else. You are just putting rotis in packaging and selling. This is called assembling a product. The same manufacturing or inventory entry can also be used for assembly of products too. Cars are assembled on the assembly because their parts are often manufactured by different companies. Watch the below video and you will learn how to create a manufacturing entry in Tally. Now, we are moving towards more broader concepts of Tally in our Tally ERP 9 notes. It is something everyone knows but still they are confused many a times. The best thing about Tally is that you never ever need to create a Balance Sheet and Profit and Loss Account in Tally. It gets automatically created when you create different vouchers or in simple words, when you pass accounting entries, Tally will build Balance Sheet and Profit and Loss Account for you. There are certain options in balance sheet in Tally which you can use which will help you in understanding balance sheet even better. For example, you can convert the balance sheet in Tally to a vertical format as per the Companies Act with a click of a button. Similarly, you can use options for profit and loss account in Tally as well. You can also move in between profit and loss account and balance sheet from each of them itself. Just sit back & watch the video below and you’ll know all the details. Stock Summary is basically a reflection of all of your closing stock in Tally. With the help of stock summary, you can see your stock in Tally in different valuations such as FIFO, LIFO, WAM and so on. You can also see gross profit on the stock items you sold in the stock summary. There are many such options like this which will help you learn about your stock in a very deep sense. You can also see opening as well as the closing stock that you have in stock summary in Tally. In the following video, you will learn about stock summary in detail along with ratio analysis. Ratios are very important for any business. There are many ratios that Tally calculates automatically including gross profit ratio, net profit ratio, current ratio and so on. By looking at the ratios, you can quickly know where your business currently stands and how better or bad it is performing and you can take the future actions accordingly. These Tally notes were really long but it needed to be long so that you can learn each and everything possible about Tally. Detailing is necessary and therefore these notes were long but I have tried to keep them as interesting and as knowledgeable as possible. Now, the time is for a practical assignment. I am giving you one single assignment which will cover everything that you have learned in these Tally notes till now. This is how in reality you will have to work with Tally. You will have a client and he will ask you for different things and you have to do it all of them in Tally. In short, this is how practical life works and I have designed this Tally ERP 9 practical assignment in the similar way. You can even download these Tally notes along with the practical assignment in the PDF format, later in this post, so you can use these notes in the future as well, whenever you feel like it. Here is the Tally ERP 9 practical assignment for you. Create a company in Tally by your name. Create 3 stock items named milk, roti and mobile. Opening balances of these 3 stock items would be milk – 10 liters, roti – 20 pieces and mobile – 5 numbers. Now, create sales ledgers – one for 28% GST rate and one for 5% GST rate. Also, create purchase ledgers in the same way each of 28% GST and 5% GST. Create 1 sundry debtor outside your state and 1 sundry debtor inside your state. Similarly, create 1 sundry creditor outside your state and 1 sundry creditor inside your state. Now, create GST Taxation ledgers for CGST, SGST and IGST for input as well as output taxation of GST. Totally, there will be 6 GST taxation ledgers. Now, create a purchase entry in which you will purchase 5 liters of milk at 5% GST rate for ₹50 per liter, 5 pieces of roti for ₹10 per piece and 3 numbers of mobile for ₹25,000 per mobile. GST rate for roti and mobile is 28%. Purchase this from inside your state. Also, fill in the E-Way bill details. Now, create a sales entry. Sell all the milk at ₹55 per liter with the same rate of GST as it was purchased. Sell 20 pieces of roti at ₹20 per piece and 1 mobile phone at ₹50,000 per mobile at the same rates of GST as it was purchased. This sale will be outside the state. Also, fill in the E-Way bill details. Now, check the profit and loss account and see what is the total value of sales for 5% GST. Go to Stock Summary and see what is the gross profit on sales of milk under the FIFO and LIFO methodology of stock valuations. Check the Ratio Analysis and see what is the current ratio and quick ratio. You can comment down below if you get stuck at any place in this assignment. Also comment the answers once you complete the whole assignment. I’ll reply you back with the correct answers. If you complete this practical assignment in Tally ERP 9 even with mistakes, you will learn much more than going to a Tally coaching center for 3 months. Just comment all of your answers and I’ll get back to you with any clarifications or suggestions. Once again you can download these Tally ERP 9 notes along with this Tally practical assignment just below. If you have come this far, I am sure you have learnt a lot about Tally from these Tally notes than anywhere else. I have really put in my sweat. I have literally written these notes in 44 degrees celcius without AC. Anyway, you can download these Tally ERP Notes in PDF format along with the Tally practical assignment from here. Everything that you read, along with all the necessary links, you can download them here in PDF. Just click the download button below and that’s it. If you really want to learn Tally, then these Tally ERP 9 Notes will help you in tremendous way. I can tell you one thing for sure. If you have sincerely learnt the notes and watched the necessary videos and completed the Tally practical assignment which is at the end of these Tally notes, you will be very good at Tally from now on. You’ll be better than 85% of the people who operate Tally. That’s a good achievement in the beginning of your learning. If you have any doubts or suggestions, just comment down below and I’ll be happy to reply you back with your answer. Till then, stay happy and take care! Thank you so much Akshay! Yes, it is the right answer. It is the right answer. The point here is that you must know the process. As I have not mentioned the opening balance amount for all the stock items – milk, roti and mobile, therefore the answers will be different for each one of you. But, you should know the process which you now know. So, congratulations for that. You have learned a new thing. Bhai, you can download the notes on this page. Or is website pe ghoomo, bahot kuch janne ko milega! I can help you. In fact, I am here to help you! Please ask what you want to ask. The question is in the article itself. very fine job for social cause., God bless you! Hai Rishit …I am just a beginner . I want to know what all basic accountancy portion should I be thorough of to start learning Tally as well as peach tree . I want to work much harder on my basics so I am asking. It will be helpful if u guide me …thank you..
You just need to learn basic accounting enough so that you can understand simple entries. I have created a free course for that and if you go through that, it will be fine for Tally. I don’t know about banking sector in Dubai. You can call someone in Dubai or look at the bank’s website to get more information. sir tallyy me manufacturing journal option jump kr raha hai me yes nahi kr pa raha hu whats the problem? Ho sakta hai aapne use enable nahi kiya ho. These are total shortcut keys in Tally. GST Filing is easy via Tally and I am going to create a post on that soon. Mr x started a business on 1st April 18 in the name of rx distributor at bbsr. He invested a capital 150000 and loan 200000 for axis bank. 1st entry is correct, 2nd. Entry wrong i thing .. loan from axis bank so…. We get loans in our bank accounts and therefore it is always Bank A/c and not cash account as you have said. please reply as which one is correct and also the reason why i was taught otherwsie.. Both are correct because in the first case which you think is wrong is right because Albert A/c is considered as capital account and generally it is written down in that way in accounting. The name of the person or a firm or a company is used for the capital account. How can I help you in Tally? I am happy that TallySchool is able to help you. Sorry I don’t have notes for Tally Practioner. For reverse charge entry in Tally I will be creating a new post and video soon. On 01/04/2018 interest received Rs. 5000 from following bank( Axis bank – 3000, Pnb Bank – 2000) credited to your same bank account. Same with the PNB bank as well. You ‘ve brought detailed knowledges in tally through this. Without paying a rupee a person can learn about tally. Thanks very much. What’s your next lessons for us. Please go through the website and you will find lots of other articles and videos as well. In banks, generally a high end software like Finnacle is used. Tally is not used in the banks that I know of. So, it won’t be useful to learn Tally ERP 9 for getting bank jobs. Also, to be sure, you can go and ask in the bank itself and they will be very happy to reply. sir,i want to know about Tally syllabus. Great Job !!! God bless you for this excellent job of helping the new and the experienced accountants. Thank you so much Pratapji for your good words and appreciation! I have learned very much from your site. Now i want to pass on my knowledge to other girls in our community. Can u help me by sending the Practical assignments and notes in pdf format for practice. I would be glad if i could get that coz your way of clearing concepts is so easy and understandable. Pls help me and send notes at prjain17@gmail.com. Hats off to ur great work. Sorry but I don’t have any practical assignments or notes. But you can go to TallySchool’s Youtube channel and explain through it. Bhalo achi Malik. I got the current Ratio as (1.46:1) and quick ratio as (0.73:1). Your answer is correct and in the range.